Located in Historic Center, this hotel is steps from Yellow Palace and Imperial Museum. Casa De Claudio De Souza and House of Princess Isabel are also within 10 minutes. Located in the heart of Petropolis, this hotel is 0.5 mi (0.9 km) from Casa Stefan Zweig and 1.7 mi (2.7 km) from Imperial Museum. Throne of Fatima and Petropolis Wax Museum are also within 1 mi (2 km). Located in Araras, this castle is 0.5 mi (0.8 km) from Itapaiva Castle and 1.5 mi (2.4 km) from Castelo de Itaipava. Serra dos Orgaos National Park and Bell Stone are also within 12 mi (20 km). Situated in Petropolis, this hostel is 0.5 mi (0.9 km) from Casa Stefan Zweig and 1.8 mi (2.8 km) from Imperial Museum. Throne of Fatima and Petropolis Wax Museum are also within 1 mi (2 km). 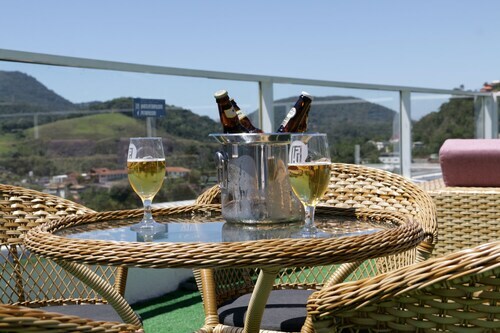 Situated in Petropolis, this luxury hotel is within 9 mi (15 km) of Estacio de Sa University, Crystal Palace, and Bohemia Brewery. Barao de Maua House and House of Princess Isabel are also within 9 mi (15 km). How Much is a Hotel Room in Petropolis? 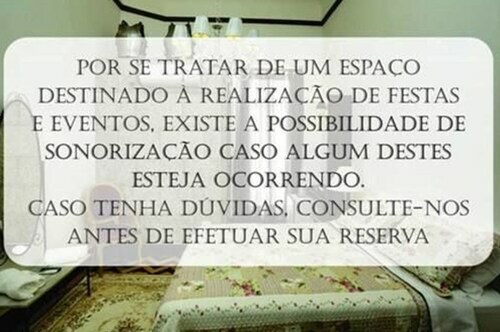 Hotels in Petropolis start at $13 per night. Prices and availability subject to change. Additional terms may apply. Looking to find a place to stay in Southeast Region, specifically close to the Petropolis area? You'll find 9 hotels on Travelocity within a 6-mile (10-kilometer) distance of downtown Petropolis. 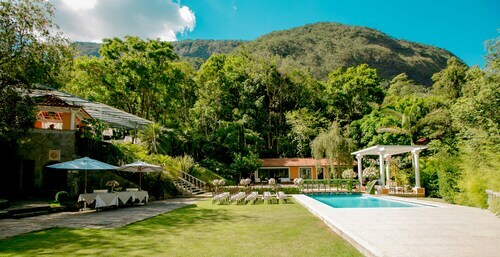 There are quite a few Travelocity-listed accommodation options you can find within a 3-mile (5-kilometer) radius of Petropolis's downtown area, including the Castelo de Itaipava - Eventos & Hotel and Pousada Altenhaus. Travelers on a budget will be happy to discover that there's a nice range of lower-priced rooms and apartments in the vicinity of Petropolis. The Clarion Hotel Itaipava is 4 miles (7 kilometers) from the main part of Petropolis, while the Pousada Paraíso Açú is 9 miles (14 kilometers) away. Two more Petropolis hotels in the lower price range include the Chalé da Montanha and the Atelier Molinaro Boutique-Hotel & Bistrot. The Urikana Boutique Hotel is around 11 miles (17 kilometers) outside of the center of Petropolis. Another accommodation option is the Pousada Princesa Isabel Dom Pedro, which can be found about 11 miles (18 kilometers) away. Other hotel options include the Hotel Casablanca Imperial and the Hotel Willisau. After you've seen Petropolis, take a little time to unveil the other attractions in the Southeast Region area. Get to know Southeast Region's traditional villages and cathedrals and also admire its beaches, rainforest and mountains. Common activities in this part of Brazil include mountain climbing and hiking. Still looking for things to do? You could spend a few hours seeing Sugar Loaf Mountain and Corcovado, which can be found in Rio de Janeiro, 40 miles (62 kilometers) south of Petropolis. Some Travelocity-listed Rio de Janeiro hotel establishments include the Rio Football-style Apartments and Santa Teresa Hotel RJ MGallery by Sofitel. Or, stay the night in Piratininga, 40 miles (67 kilometers) to the south of Petropolis, where you can choose between the Icaraí Praia Hotel and Niteroi Hostel. Regardless of whether you're passing through or spending a few nights in Piratininga, don't miss the Praia do Sossego and Pedra Da Baleia. For the modern traveler planning on arriving through Galeao - Antonio Carlos Jobim International Airport, you may choose to book accommodation at Linx Hotel International Airport Galeão, or Rio Aeroporto Hotel, both of which are conveniently located nearby.